“10% discount for Australian Seniors Card holders, when booking direct with Sacred Earth Safaris. Only valid on Scheduled Tours. Not valid with any other offer"
You will be collected from your Karratha hotel at 6.30am this morning to begin your private 6 day 4WD tour through the Pilbara. We spend today in Millstream- Chichester National Park, which is a lush oasis of deep gorges and pa lm- fringed rock pools which provides a stark contrast to the surrounding landscape of rocky escarpments and rolling spinifex-covered hills. We enter the park from the north and have a swim at Python Pool, a permanent freshwater plunge pool at the base of a cliff in the Chichester Range Escarpment. We also take a walk to the top of Mt Herbert, where we are treated to a splendid view of the Savannah lands, including Pyramid, Sherlock and Warambie stations. Departing the park, our destination this evening is Tom Price, the highest town in WA at 747m above sea level. Dinner tonight can be purchased at the hotel restaurant. This morning, at 10am, take a guided tour to the Rio Tinto Iron Ore Mine site, one of the world's largest open cut iron mines. The 1.5 hour tour will take you into the heart of the mine site operation and includes viewing of the Haul Truck workshop area, vist the main pit area, view working trucks, shovels and drills, the crushing and screening plants and the train lo ad out area. We continue into Karijini National Park, in the Hammersley Range. Karijini is WA's 2nd largest National Park, encompassing some 627,442 hectares of spectacular, rugged country, ancient geological formations and a variety or arid-land ecosystems. Massive mountains and escarpments rise out of the flat valleys. The high plateau is dissected by breathtaking gorges, and stony, tree-lined watercourses wind their way over the dusty plain. The slow process of erosion has carved the shape of the land out of rocks that are 2,000 millions years old, to form this intriguing landscape and complex ecology. A variety of ecosystems are represented in the park and these are home to range of wildlife including a variety of birds, native rodents, native marsupial carnivores (such as the Pilbara ninguai-resident, but nocturnal and shy), red kangaroos, euros, Rothchild's rock wallabies, bats, dingoes, reptiles and amphibians such as frogs, geckoes, goannas, dragons and legless lizards. Termites and the pebble mound mouse also make their homes here in the form of mounds. Our first stop within the park is Hammersley Gorge, where we'll find amazing coloured banded iron formations. Take a dip in the natural spa pool st the Gorge and enjoy a spa treatment the way nature intended- surrounded by amazing rock formatons almost as old as the earth itself. We make our way to our accommodation and after checking in, you may like to walk to Joffre Lookout where rock steps take you down to the lookout to view this spectacular curved waterfall forming a natural amphitheatre. We travel to the western side of the park today, to Dales Gorge, through to Fortescue Falls, Fern Pool and Circular Pool. Have a refreshing swim in the spring-fed permanent falls of Fortescue falls, ramble along the gorge floor to the lovely fern framed Fern Pool and enjoy the hidden gardens of Circular Pool. We also visit the Visitor Centre. 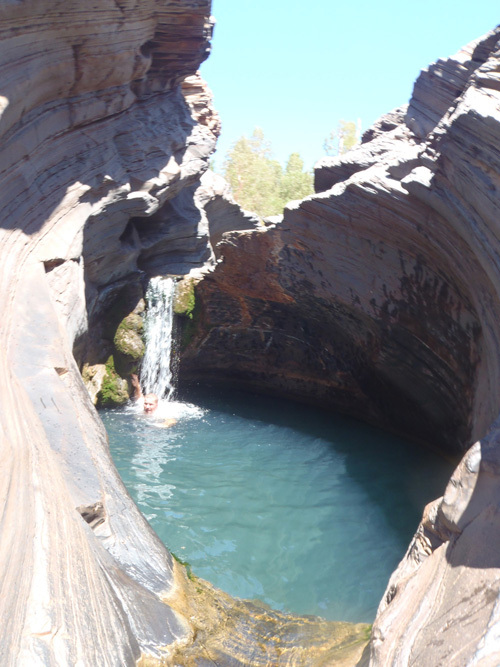 This afternoon we take a walk through Kalamina Gorge, one of the most picturesque in Karijini. A short walk takes you down a steep track to the base of the gorge to a small permanent pool, complete with waterfall and draping ferns. There is a longer, more difficult walkk for those who feel energetic. If you follow the trail deep into Kalamina Gorge, you will be rewarded with a lovely walk downstream, past rock pools and beautiful rock walks, finishing at Rock Arch Pool. This morning is spent exploring Handrail Pool, which is reached by walking through Lower Weano Gorge. We also enjoy the scenery at Junction Pool and Over Lookout, located at the junction of four mighty gorges and offering one of the most stunning panoramas in WA. This afternoon we explore Hancock Gorge, where we climb down a ladder and walk deep into the gorge, through narrow chambers and to beautiful rock pools, for a swim. We finish the day at Knox Lookout, where we'll take the steps down to the lookout and watch the view spread out in the distance. Departing the park this morning, we make our way north east towards the mining town of Port Hedland, one of the largest and busiest iron ore ports in the world. We'll arrive mid-afternoon and the rest of the day is yours to explore the town-we're located on the Esplanade, so perhaps walk to the nearby Observation Tower for sunset. Dinner tonight can be purchased at the hotel restaurant or one of the nearby restaurants. We continue north again this morning to the popular holiday town of Broome, which sits on the western edge of the massive Kimberley region. With it's sweeping white beaches, rich red outcrops and blazing turquiose water, Broome is a great place to relax and unwind. Our lunch stop is the pristine eighty mile beach, where the Great Sandy Desert meets the Indian Ocean. The area is also a protected RAMSAR listed wetland of international significance and regulrly supports over 4000,000 shorebirds. We'll arrive into Broome late afternoon and you'll be dropped off at your accommodation. This tour is only operated as a private charter (sole use of vehicle and driver guide) and is valid for travel from May to October only - please enquire for prices and further details.